“The most interesting thing we discovered was the groundwater chemistry in one of the areas most heavily developed for shale gas – an area with 1400 new gas wells – does not appear to be getting worse with time, and may even be getting better,” said Susan Brantley, director of Penn State’s Earth and Environmental Systems Institute and distinguished professor of geosciences. In these rare instances – seven of the 1,385 water wells near natural gas development where the researchers identified “slightly elevated levels of methane” — the report notes that these “gas anomalies” could not be specifically linked to biogenic or thermogenic sources. Further, they found that a vast majority of the water samples with elevated methane were near mapped faults, valley and anticlines, indicating natural methane migration. 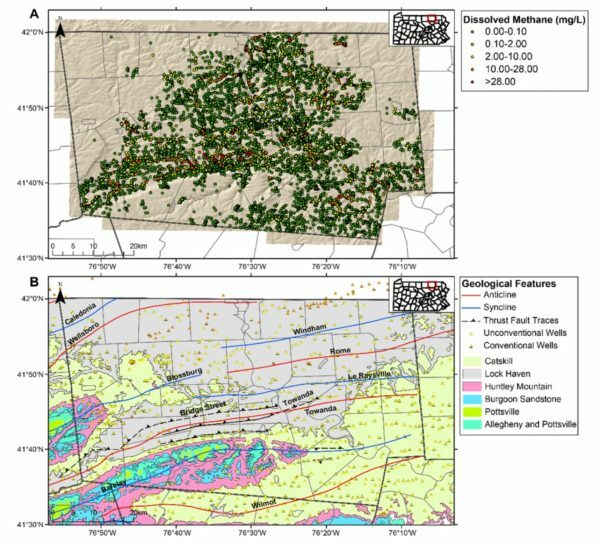 As the following graphics from the study show, analysis of spatial and temporal patterns reveal that methane “hotspots” are aligned with the geological features of the region rather than proximity and concentration of natural gas development. 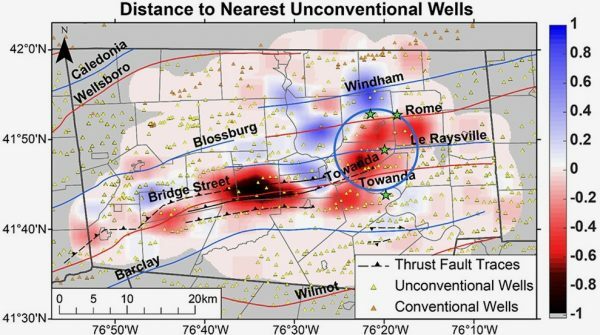 In contrast to the lack of association between shale gas wells and elevated methane in groundwater, the distinct association between proximity to anticlines and elevated methane levels in the water samples was very evident. “If groundwater is improving, likely explanations include the imposition of the Clean Air Act since the 1970s, decreases in coal mining and steel manufacture in the region, and the trend to transform power plants from coal to gas. This study comes on the heels of last month’s long-anticipated publication of a University of Cincinnati study finding no evidence of groundwater contamination in heavily drilled regions of neighboring Ohio. These latest university studies echo the conclusions of no fewer than two dozen scientific reports — including the EPA’s landmark five-year study — that further confirm what is becoming more and more evident: fracking is not a major threat to groundwater.